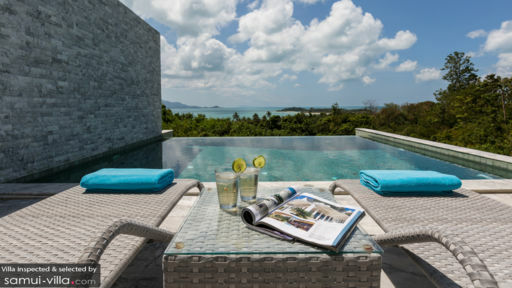 A contemporary and chic property in Samui’s Bophut area, The Sun Kissed Villa is a three-bedroom haven offering panoramic views of the ocean out front along with the vegetation that encircles the dazzling water. The private villa is perfect for families and friends looking for a luxurious experience in the midst of natural splendour. There is an infinity pool right outside from where you can gaze at the ocean endlessly. Head outdoors to explore the beaches, sightsee, and visit the famous and historical Fisherman’s Village Bophut! The Sun Kissed Villa features three, well-furnished, and air-conditioned bedrooms that have been designed to offer utmost comfort and luxury to guests. The master bedroom is a lavish space adjoined to a private terrace with rattan sitting for two. It has been furnished with a comfortable, king-sized bed, and a lounge chair overlooking the view. The second bedroom is similar to the master suite and there is a third bedroom that has been furnished with single beds. There are en-suite bathrooms with each bedroom that have been equipped with all modern amenities and walk-in showers for your convenience. Flanked by natural stone walls lies the 6-metre swimming pool at The Sun Kissed Villa inviting you to dive right in and enjoy the warm weather while lounging in its cool waters. The beautiful views that greets you spans across the ocean beyond lush green flora that borders the villa property. You can choose to lounge in the pool or relax on the rattan sun chairs found on the pool deck. Enjoy a glass of chilled iced tea or a cocktail of your choice as you breathe in the fresh, tropical air and let loose for a wonderful time. An alfresco dining area is found on the deck with a six-seater dining table, a bar with stools, and even a gas BBQ for freshly-grilled delicacies! The modern and elegantly-appointed living area is open-concept as it leads to the pool deck and provides splendid views of the scenic beauty of the island. Furnished with striking black couches in an all-white space, the chic interiors speak for the contemporary aesthetics prevalent in the living room. Paying attention to your entertainment, the living room has been fitted with a massive, flat-screen TV accompanied by an iPad that can used to operate the system for smart home technology. For dining, besides the alfresco option, you have the luxury of indoor dining as well since there is a six-seater dining table found in the living room overlooking the pool. A fully-equipped, wester kitchen is also at your disposal so you can even cook light meals or a full-blown feast for yourself and guests. A personal chef can be appointed if you so wish as their skills will wow you into a food-induced nirvana! From the comforts of this beautiful rental in Samui, island-living never seemed more appealing as you have a view straight out of a dream and luxuries to make you feel at home and at ease. There are housekeepers and other maintenance staff to ensure the villa remains spotless clean. A villa manager oversees the smooth functioning of the villa and at the same time makes it a point to deliver whatever you might need. A personal chef can be requested for, if you wish. Situated on a prime location near Bophut’s Fisherman’s Village, there are a world of things to do, see, and experience around the villa. Pay a visit to the popular Big Buddha statue, a historical landmark that is a must-visit! There are beaches nearby for a fun day out in the sun that you can end with drinks at a beach club.